I never met my paternal grandfather, and more's the pity. From what I'm told, we had a lot in common: a love of language, a passion for musical theater, lefthandedness, our first initial, and most of all - he grew up on the same street that I now live on. My grandfather grew up in Nashville, Acklen Avenue near Vanderbilt, I live on Acklen near 12th. It's a long street that's broken up by Belmont University. Still - same street. That said, I know what he looked like because I've seen photos. So, all of that is backstory to the following. I went to see my mother last weekend, and we went into Pier 1 on a fool's errand. My mother was looking for small stuffed bunnies to give the daughter of a friend about to have twins. They didn't have little bunnies. They did have a cute bigger bunny, which she bought for the soon-to-arrive twins' older brother. Mom couldn't remember the big brother's name. I supplied it for her and she said she didn't think that was it. It was. His name is Mason. Anyway, we're looking around Pier 1, which is one of those stores that got too Pottery Barn for its own good. Back in the day, they had killer clothes. One of the best dresses I ever owned came from Pier 1. They had interesting cheap housewares. World Market has sort of supplanted the space that Pier 1 used to occupy. But, if you need really good throw pillows and money is no object, get thee to Pier 1, post haste. That said, they had tons of cute stuff for Spring. We were wandering, and I spotted this little salad plate, and I showed it to Mom. "Look", I said, "It's A in bunny form!" Quick sidebar. The grandkids who were alive when he was called him Papa. I have never called him anything but A. Everyone called him A. His given name was Adolph, but he was Jewish, so... for reasons that are pretty clear, he went by A. 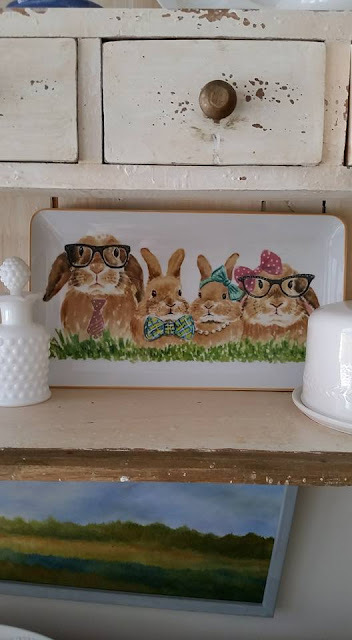 So this bunny had on a pair of glasses and a necktie and reminded me of my late grandfather. We explore the table and find that the plates are a set of four. The mother plate featured a bunny that had glasses like some my grandmother wore (she was Baba). There was a little girl bunny in pearls (my Aunt Mary) and a little boy bunny in a bowtie (Dad). Then we saw a platter with all four family members. We marveled at how much it looked like the family. So when we got home, we got online and sent one to each of Aunt Mary's three kids. My Aunt, my Grandmother, and even my Father loved Easter. My Grandfather probably liked it too - he loved Christmas, that I know. He was a fairly secular Jew, if that's a thing. I think Dad would have loved this platter, and I think he would have ordered one and sent it to Mary. I really wish I had photos to prove how accurate this portrait really is... you'll have to trust me on this. I trust you because I'm floored by a weird coincidence: I grew up knowing a man named Adolph, but went by Al, who had a great love of language, wore glasses and a necktie, and was left-handed...I kind of see some resemblance in the bunny. He was like a grandfather to me; I knew him better than either of my biological grandfathers. He was Presbyterian, though, not Jewish, although he was deeply interested in Judaism. Actually it may not be that much of a coincidence. The name Adolph at one time was at least as common as glasses and neckties.